In the name of energy we suffer the indignities of rising prices and shortages. We warm the Climate, deplete the ozone layer, pollute our air, poison our environment with acid rain, dump tons our mercury into our oceans each and wage wars. We also cultivate a dangerous dependency on foreign sources of fossil fuels that weakens our national security. Where does the world get its energy? According to the energy information administration, worldwide consumption comes from petroleum (39), Coal (25), Natural Gas (22), and Renewable, (Primarily burning 120 million barrels of oil a day. Natural gas consumption will shoot up from 90 trillion feet in 2001 to 176 trillion cubic feet in 2025. By 2020 we'll be pumping 9.8 billion tons of carbon dioxide the primary culprit in global warming into what remains of our atmosphere. How long will the party last? At current rates of consumption, our oil reserves will last 45 years, natural gas 70 years and coal the world's most abundant and polluting fossil fuel somewhere around 200 years. The fossil-fuel party might end sooner than expected. In a world hungry for energy, so called “current rates of consumption” increase by month & day. Fossil fuels are burned to produce energy and electricity, and the developing nations want their share. China, India, Latin America, Africa and the and the rest of Asia will help grow worldwide demand for electric power 75% over the next decades. Yet all the while as we protect, defend and use up the finite supply of fossil fuels, while we burn it up and deny it to future generations we steadfastly turn a blind eye to an unlimited fuel supply, oceans of it, the same fuel that powers the sun. That fuel is hydrogen. Hydrogen, bound with oxygen makes water. Hydrogen is the simplest element known to man. An atom of hydrogen has only one proton and one electron. It is also that most abundant gas in the universe and the source of all energy we receive from the sun. Hydrogen dos not exit naturally on earth and are found only in compound forms such as water, methane, coal and petroleum. Hydrogen as a fuel is currently produced by a process called “steam reforming”, where high-temperature steam separates hydrogen from carbon or by “electrolysis” which splits water into its basic elements, hydrogen and oxygen. Hydrogen is a clean-burning fuel that produces water vapor as it’s by product. Hydrogen can be made from water and when it burned turns back into water. Sounds simple, but it takes energy to make hydrogen from water. So the question becomes: is there a way to make hydrogen without burning fossil fuels and continuing of this relentless path of depletion and pollution? There furnace 93 million miles away that keeps us alive on this planet. A very small portion of the energy radiated by the sun one part in two billion strikes the earth. Just one day of the solar energy is enough to supply only few country needs for one and a half years. We have technology to capture and use it but we are shortsighted, deferring to the convenience of fossil fuels and ignoring the problems entail. The vast and readily available energy from the sun isn't news. The technology has been developed to use the heat from sun to produce hydrogen as an energy source. It’s a fantastic energy loop. The heat from focused solar energy can be used the power engines that produce electricity with no pollution. That electricity, in turn, can be used to separate the hydrogen from water. The hydrogen can then be used as a fuel. Yet, even though we have this practical, hands-on knowledge, even though we have proved technology we continue to take baby steps to prevent the deadline when our oil and natural gas and sooner or later coal reserves will be exhausted, once these fuels are gone, burned up in the short space of a few hundred years, they are gone forever. Our Hydrogen Fuelled car is in use today, Prototype cars is using Hydrogen/Hydride storage system developed by us and our devices will be entered in commercial markets in Europe 2010. We can end over energy dependence and despoiling of the earths environment with a fuel that will last humanity tens of millions of years. Hopefully, that transformation will come about when enough of us raise our voices and urge our government, organization, representatives, and whom it concerns to move toward a clean energy economy based upon renewable fuels. HOW WE CAN CUT GLOBAL WARMING POLLUTION TO SAVE HUMAN LIFE. HYDROGEN FUEL as an alternative low cost energy source of conventional petroleum based fuels like petrol, diesel and kerosene corresponds its use as a fuel in different internal combustion engines and I.C.E. powered transportations vehicles. It is almost a complete substitute of fuel with better weight-to-power ratio, when used as automotive fuel. It reduces fuel cost of vehicle and reduces the pollution load And vehicle emission to improve air quality increasing pollution free environment.The primary source of hydrogen is water. Hydrogen can be prepared by various methods. In chemical plants, through solar electricity also fro natural sea water, cocktail of microbes, organic waste, distillery waste to produce biological hydrogen, water resources by splittingwater through electrolysis. Hydrogen as a fuel corresponds to the fact that it is clean, on burning it reverts back to water, the basic material from which it is produced. It’s a potential hazard to agriculture and civilization. Other utilizations and application of hydrogen is as a fuel for house hold cookinggas, industrial purpose and space heating. Adoption of this technology is necessary as a secondary energy source to achieve low cost fueling and pollution free environment. We have developed Hydrogen Energy Technology on Hydride Safe Storage System. – using Hydrogen as a fuel . The company prides itself in developing the Hydrogen Energy Fuel (the Fuel for 21st century) a most economic substitute of fossil fuel. This technology is Eco- Friendly without any pollution. We have already developed Hydrogen Fueled car and Generating Sets to solve Global warming crisis. HYDROGEN IS GAINING WORLDWIDE ATTENTION AND RECOGNITION AS ONE OF THE LEADING ALTERNATIVE FUELS THAT CAN REDUCE THE COUNTRY'S DEPENDENCE ON IMPORTED FUELS, REDUCE GREENHOUSE GASES AND GROW THE ECONOMY. There is no doubt that all over the world the problem of energy availability shall be solved by HYDROGEN, the most readily available, clean, light, and powerful and non-polluting fuel existing on our planet. While using our technology a country can save huge amounts on the import of petroleum fuels. Not only will that but the problem of pollution and global Warming that plagues the world today be eradicated. Human life will be much better without a thick cloud of smog hanging over their heads. "ECOLOGY AND ENERGY ARE TWIN CONCERNS OF DEVELOPMENT"
Our unique a new mobile innovative system for production of electricity.This device produces electricity by the force of flowing water which can be considered as a renewable energy. So our invention is one of the best technologies and is the cheapest route method to generate the most needed electricity power generation and is the most useful technology to solve the energy crisis of the years to come. Our devices can be installed in anywhere on our global. The installation of the mobile device can be done in a few hours, all the components are already connected and the exploitation is immediate. Our technology in the future is the most economical rather the cheapest route to generate the electricity power production system in which the only initial installation cost-again which is cheaper to the conventional routes will be the only ONE – TIME expenses, with almost – NIL- Maintenance expenditure and with no costs to generate the power i.e. without any solid/gas/liquid or any other sort of fuel and hence no pollution at all, it is a environmental friendly technology. Our unique device produces energy by the flow and fall of water which can be considered as a renewable resource. To build a huge hydro power station requires big civil construction of dams and structures, water reservoir which many result in evacuation of people residing in catchments and down steam areas. With our designed unites, there are no such problems, not even smoke, fumes, gases, spoilage of oils. They generate electricity which is more than sufficient for local needs and will be welcomed by all. For the first time in the world we have developed this unique system for producing electricity with flowing water. From this device the cost of electricity is much cheaper than other power station including Hydro and Fossil Fuels. To install our device the investment is cheaper than the conventional routes and without any maintenance and is pollution free.Day by day the world energy consumption has energy significantly and was satisfied by the use of oil and natural gas along with coal, lignite, nuclear reactor, hard solid waste etc. In recent past wind mills and solar energy were also used for energy. BUT THESE TECHNOLOGIES ARE VERY COSTLY NEED A HUGE AMOUNT OF INVESTMENT AND PLACE AND TIME FOR INSTATLLATIONS. While using our technology is capable to produce almost inexpensive yet commercially viable scale of electrical power that utilizes the flow of water, under current of water, under stream of canal water, river water, ocean tides- waves as its sole power generation source with proven technology and it has already been investigated and is running with satisfactory results and is now an essential technology for the world. We have designed and manufacturing of high performance stand alone and grid connected wind turbines in the range from 1,000 Watt up to 20 kW. Wind turbines for your weather conditions and for your application. The wind power generator is an equipment to convert wind energy into electric power which is changed into storage battery group. It can be widely used in rich wind areas but without normal energy supply from any power system .It is capable of providing power for lighting, TV, telecommunication equipment and so on. Doing business means more to us than selling quality wind turbines. We help you to supply your energy needs. This means that our dealers are trained to estimate your energy requirements and to assist you in finding the best solution for your needs. After selecting the best technological option, we shall assist you in filing building permit requests and in securing all possible grants. We shall not only supply the hardware, but also the services that will enable you to relax in the knowledge that you have professional assistance. We design and provide Large Wind turbines from 750 kW to 2 MW. Wind turbines produce electricity by using the natural power of the wind to drive a generator. The wind is a clean and sustainable fuel source, it does not create pollution and it will never run out. Wind energy technology is developing fast, turbines are becoming cheaper and more powerful, bringing the cost of renewably-generated electricity down. Europe is at the hub of this high-tech industry. Almost all wind turbines producing electricity for the national grid consist of rotor blades which rotate around a horizontal hub. The hub is connected to a gearbox and generator, which are located inside the nacelle. The nacelle houses the electrical components and is mounted at the top of the tower. This type of turbine is referred to as a 'horizontal axis' machine. Wind turbines can have three, two or just one rotor blades. Most have three. Blades are made of fibreglass-reinforced polyester or wood-epoxy. The blades rotate at 10-30 revolutions per minute at constant speed, although an increasing number of machines operate at a variable speed. Power is controlled automatically as wind speed varies and machines are stopped at very high wind speeds to protect them from damage. Most have gearboxes although there are increasing numbers with direct drives. The yaw mechanism turns the turbine so that it faces the wind. Sensors are used to monitor wind direction and the tower head is turned to line up with the wind. Towers are mostly cylindrical and made of steel, generally painted light grey. Lattice towers are used in some locations. Towers range from 25 to 75 meters in height. Commercial turbines range in capacity from a few hundred kilowatts to over 2 megawatts. The crucial parameter is the diameter of the rotor blades - the longer the blades, the larger the area 'swept' by the rotor and the greater the energy output. At present the average size of new machines being installed is now super megawatt, 1.3-1.85MW, and there are larger machines on the market. The trend is towards moving to these larger machines as they can produce electricity at a lower price. There are many different turbine designs, with plenty of scope for innovation and technological development. The dominant wind turbine design is the up-wind, three bladed, stall controlled, constant speed machine. The next most common design is similar, but is pitch controlled. Gearless and variable speed machines follow, again with three blades. A smaller number of turbines have 2 blades, or use other concepts, such as a vertical axis. Most turbines are upwind of the tower - they face into the wind with the nacelle and tower behind. However, there are also downwind designs, where the wind passes the tower before reaching the blades. Conventional methods of generating electricity burn fuel to provide the energy to drive a generator, usually by using the heat to provide steam to drive a turbine. These technologies may use fossil fuels, - coal, oil or gas - or nuclear fuel. Using fossil fuels creates pollution, such as oxides of sulphur and nitrogen which contribute to acid rain, and carbon dioxide which contributes to global climate change. Although conventional sources of power dominate the energy needs of European countries, wind energy is growing rapidly. Renewable energy sources currently provide nearly 5.4% of the European Union's primary energy needs1 and have the potential to provide much more. The mono-crystalline solar module is composed of solar cells with the average conversion efficiency above 15%, EVA sheet, solar glass and Tedlar (TPT) back sheet compounded from fluoric-plastic and dacron. The module adopts reliable welding technology and high-vacuum heating lamination process and is equipped with anticorrosion-treated aluminum alloy frame and watertight terminal box, According with IEC61215 and the II grade standard electrically. As a result, it takes on a rational structure, has anb ultraviolet aging resistance. The polycrystalline silicon solar module is composed of solar cells with the average conversion efficiency above 14%, EVA sheet, solar glass and Tedlar (TPT) back sheet compounded from fluoric-plastic and dacron. The module adopts reliable welding technology and high-vacuum heating lamination process and is equipped with anticorrosion-treated aluminum alloy frame and watertight terminal box. According with IEC61215 and the II grade standard electrically. As a result, it takes on a rational structure, has an ultraviolet aging resistance. THIN FLIM a-Si ( AMORPH SCILICIUM SOLAR MODULES). The present technology of the company is based on the double pin diodes formed from amorphous silicon (a-Si) on sheet glass. The main advantageous feature of the amorphous Si PV system is the lower temperature coefficient of efficiency compared to the single crystalline reference and the ability to work even under low-light conditions. Therefore, the total amount of electricity produced (measured in KWh) over a long period is higher than that of the traditional single– or multi crystalline modules exposed to the same conditions, and efficiency above 18%. Concentrating photovoltaic (CPV) systems convert light energy into electricity in the same way conventional PV technology does. The difference lies in the addition of an optical system that focuses a large area of sunlight onto each cell for providing reduced energy costs and improved manufacturability and reliability. High Efficiency Cells: The cells used in CPV systems are over twice the efficiency of traditional silicon-based PV cells, approaching 40% compared with 15% - 19% for traditional silicon. The use of these cells provide much higher energy yield with less photovoltaic material. JBT- Hydro designs and manufactures small hydro systems ranging from 4kW to 100 kW. Each system is designed and built at our manufacturing facility in India. For our customers with residential or small community projects, JBT Hydro provides a broad selection of hydroelectric systems up to about 100kW, each delivering high efficiency, quality and reliability at a reasonable cost. If you have requirements for larger systems or custom designs, please refer to JBT Commercial Hydro Systems. The heart of a JBT Hydro system is the water turbine. Efficiency counts most here, and we take great care to ensure maximum power transfer. JBT Pelton runners are all-metal, cast as a single unit. Bucket tip, splitter and exit angles maximize the transfer of hydraulic energy to the turbine shaft. Each bucket is hand-polished, with special attention directed to the rear of the bucket to minimize internal aerodynamic drag. Similar procedures are employed for JBT Crossflow and Francis turbines, using the highest quality materials and advanced manufacturing techniques. Most importantly, JBT turbines are backed by a group of experienced professionals who know hydro systems, and are dedicated to the success of your project. We strongly recommend that you let JBT Hydro design the proper turbine system for your site, because the most efficient system involves many complex factors. There is no charge for this service. Beginning with your measurements of HEAD and FLOW, JBT experts will specify the right combination of turbine type, diameter, bucket or blade characteristics, nozzle sizing, shaft speed, housing dimensions, and more. We think it’s important that you get the most power possible for your investment. OUR DUAL – JET SYSTEM,DRIVES GENERATOR, AND USES A NEEDLE NOZZLE TO ALLOW ADJUSTMENT FOR CHANGING FLOW CONDITIONS WITHOUT SHUTTING THE SYSTEM DOWN. Drinking Water - From Sea water and Brakich water by Renewable Energy to save our world. WATER - THE ELIXIR OF LIFE. One of today’s main problem is providing sufficient drinking water for the world’s growing population. About three billion people have no direct access to clean potable water. Water is not only fundamental for human life, but is also essential for social development and prosperity. Global water shortage is already a source of great social tension and ecological problems. THE DESALINATION SYSTEM BY RENEWABLE ENERGY TECHNOLOGY IS FREE ENVIRONMENTAL, PRODUCING THE DRINKING WATER TO SAVE OUR WORLD, SAVE OUR LIVES, SAVE OUR FUTURE, SAVE OUR NEXT GENERATION. In the late 1940s, researchers began examining ways in which pure water could be extracted from Sea Water and Brackish water. They found it was possible by Reverse Osmosis in a practical process to produce drinking water. In Canary Islands, Spain, RO Desalination plants have been used for more than 40 years, The reverse osmosis desalination plant is intended to produce the drinking water and industrial water from seawater or brackish water economically. It can also be applied to the improvement of drinking water quality to remove the harmful substances such as trihalo methane, nitrogen, etc., of which contamination in water has become a problem in these days, and further, to the recovery of water from secondary treated water of sewage. For the treatment of industrial wastewater, it is not only possible to concentrate and separate the dissolved component but also to re-use the recovered water for industrial water. When some valuables exist in the concentrated component, such component can be recovered by using the reverse osmosis desalination plant together with the refining system. Initially, this system of the plant consumes huge amounts of electricity. It has not been introduced to many countries due to the high costs of drinking water. Many people know the supply of fresh water is becoming an issue of increasing importance in many areas in the world. In arid areas potable water is very scarce and the lives of people in these areas strongly depends on the amount of available water. Seawater desalination requires large amounts of energy, and if this energy is produced by fossil fuels, it will harm the environment. Therefore, renewable energy sources coupled to desalination offer an attractive solution. My RO desalination plant powered by RENEWABLE ENERGY ( Solar, Wind ) and especially Hydrogen Energy provides drinking water at lower costs, and you can install the plant in any remote area, where there is no electricity available. Renewable energy systems produce energy from sources that are freely available in nature. Their main characteristic is that they are friendly to the environment, i.e. they do not produce harmful effluents. Renewable energy sources (RES) coupled to desalination offer a promising prospect for covering the fundamental needs of power and water especially in remote regions, where connection to the public electricity grid is neither cost effective nor feasible, and where the water scarcity is severe. I am MR. JAY VIHOL, a Scientist ,Managing Director of JIMPEX BIO-TECHNOLOGY, developing Hydrogen Energy Project with participate / collaboration with Canary Island Foundation. Govt.of Spain. The following products to save Energy & environmental. HYDROGEN / HYDRIDE PRODUCTS ->Hydrogen / Hydride Motocycle ->Hydrogen/ Hydride Fuel Gen Set capacity 5 kW. 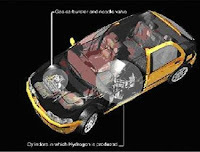 ->Hydrogen/ Hydride cooking gas ( replacement of LPG and Electrical burner) ->Hydrogen/ Hydride Fuel car. ->Hydrogen/ Hydride mobile power station capacity 2.5 MW ->Hydrogen/ Hydride Photovaltaic Hydrogen Generation and re-fueling Station. RENEWABLE ENERGY POWER STATIONS ->Electricity Generation Devices, running with any kind of flowing water. ->Natural Sea Water Electricity Generation Devices, generating Electricity through Sea Wave Current under Sea Water. CONSULTANT & CO ORDINATOR / CO SCIENTIST for following projects. ->RO Desalination plant powered by Renewable Energies to produce drinking water from Sea/Brackish Water capacity 5 m3/day up to 10,000m3/day. ->Solar ( SPV and CPV technology) capacity 1 kVA to 5 MW. ->Wind Turbines. Capacity 1 kVA to 2 MW.